Ninja Intelli-Sense Reviews - Is it a Scam or Legit? With 8-12 functions, Smart Vessel technology, and adjustable power, speed, and gearing, Ninja Intelli-Sense claims to deliver all your favorites recipes. This includes total crushing (smoothies, frozen drinks, ice cream, snow cones), food processing (puree, chop, dough, dips), high-speed blending (smoothies, extracts, refreshers, dressings), and spiralizing (fettuccine and spaghetti blades). Compared to competitors, Intelli-Sense’s promotional video advertises that after snapping on a vessel, the smart base will automatically adjust the motor’s power, speed, gearing, and its precisely calibrated patterns of pulsing and pausing, which will allow your ingredients to fall back down onto the blade. Together, we’re told these programs were each designed by a team of chefs to deliver the results you need. Just snap on the smart vessel, tap the program you want, and go. For the money, can you expect the Ninja Intelli-Sense to provide meaningful value? Will it deliver your favorites recipes with just one touch, while making changing your menu as easy as changing your vessel? Give us a few minutes, and we'll walk you through what we learned during our research. How Does the Ninja Intelli-Sense Work? All Intelli-Sense devices are approximately seven inches wide, 10 inches deep, and 18 inches tall; feature 1,200 watts of power, between eight and 12 Smart Programs (more next), a 2.5-foot cord, and a flat touchscreen display for selecting Smart Program. Just choose your Smart Vessel, attach it to the Smart Base, which will recognize the Vessel and display the corresponding Program, and you’ll achieve optimal results each time, whether making fresh salsa, pizza dough, margaritas, ice cream, or anything else. During each cycle, you can pause the process by pressing the same button you initially selected to begin, which will also pause the digital time and its countdown until resumed. Pressing STOP from there will halt the program entirely. Users can also choose between three manual settings (Low, High, Pulse) for customizing and fine-tuning different textures. As far as cleanup goes, only Intelli-Sense’s containers, lids, and blade assemblies are top rack dishwasher safe, while the motor base and attached touchscreen will need to be wiped with a soft, clean, damp cloth. All Intelli-Sense containers are made of BPA-free Tritan plastic, and the Pro Extractor blades feature a stacked design that breaks down everything from whole fruits and vegetables to ice and seeds, along with rustproof, dishwasher safe, high-quality stainless steel. However, it’s important to point out that the FAQ emphasizes the device is not designed for hot blending. What’s the Difference Between Each Ninja Intelli-Sense Model? There are some meaningful differences between each Intelli-Sense model, which could impact your overall satisfaction. Here, we’ll briefly discuss what these are. Single-Serve Cups with Spout Lids (24 oz.) – Two cups that liquefy fruits and veggies to provide juices, smoothies, dressings, and purees. Includes one of the Single-Serve Cups found in the Duo package, in addition to a 64 oz Precision Processor that promises to make meal prep fast and easy by slicing, shredding, mixing, chopping, and making up to two pounds of dough, all in one bowl. This model also features a total of 12 Smart Program; four of the same above, in addition to Chop, Dips, Puree, and Dough. Adds the Auto-Spiralizer, which features a 3” Feed Chute that can turn a wide variety of fruits and vegetables into noodles that can work as a healthy, tasty replacement for traditional wheat-based noodles—everything from salad to spaghetti and meatballs. How Much Does the Ninja Intelli-Sense Cost? During checkout, you’ll be able to purchase accessories priced between $24.95 and $34.95, obtain discounts off additional systems, and choose priority processing. We also found these models available through third-party retailers like Best Buy, Target, Walmart, Bed Bath and Beyond, and JC Penney, for between $170 and $375. All direct orders come with free shipping, a 60-day money back guarantee (less S&H), and a one-year warranty against defects in material and workmanship. A lifetime warranty can be purchased during checkout for an additional $14.95. In order to request a refund or process a warranty claim, customer support can be reached at 866-826-6941. What Can We Learn From Ninja Intelli-Sense Customer Reviews? Between sites like Amazon, Best Buy, and Target, Ninja’s Intelli-Sense systems had more than 100 customer reviews and a combined average rating of about 4.5 stars. Most compliments appeared to revolve around ease of use—even for those otherwise not adept in the kitchen, along with its wide variety of functions (and the fact that it uses only one base that features a relatively compact footprint). The few complaints referenced its plastic—versus glass—containers, as well as difficulty obtaining replacement parts. As a company, SharkNinja Operating LLC is based out of Needham, MA and has been in business since 2003. In that time, they’ve created numerous other popular devices like the Coffee Bar, Duo Blender, Rocket, and Powered Lift Away. In addition, they held more than 320 closed complaints and 135 negative reviews with the Better Business Bureau, as of 12/4/17. Most of these seemed to revolve around customer service issues; frequently, difficulty obtaining service or replacement parts under warranty. In each instance, a company representative responded with a solution. 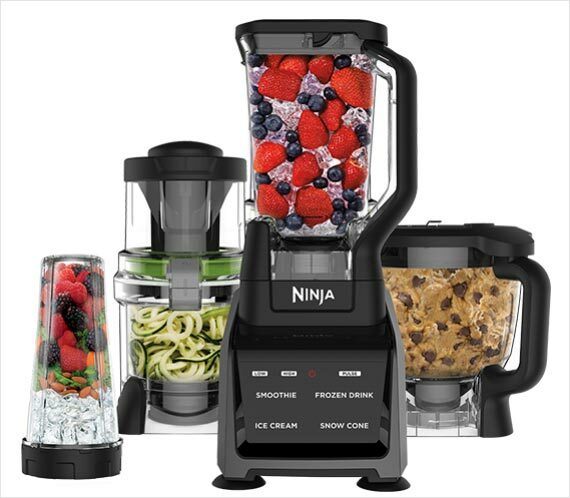 Are There Other Multi-Function Smart Blenders & Food Processors Like Ninja Intelli-Sense? 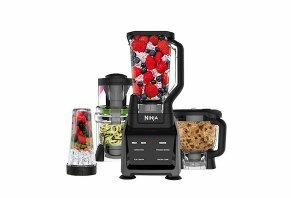 While there are perhaps hundreds of multi-function blenders and food processors available—some with interchangeable attachments, touchscreens, and/or pre-set programs—if you’re looking for all of this functionality in a single device, the Ninja Intelli-Sense was the only option in town at the time of our research. Furthermore, at between $170 and $300, it’s meaningfully less expensive than other ‘smart’ competitors like the BlendTec Designer 725 ($600). Which of these options will best meet your needs? According to TheSpruce’s Mariette Mifflin, that’s exactly where you’ll want to start; your needs. Specifically, those functions you’ll use most often. In other words, you might not need to pay a higher price for a 12-function model if you’ll only use two or three functions on a regular basis. Pro tip: Plan on crushing ice? She notes that you’ll likely want to focus on models that deliver a minimum of 500 watts. Speaking of which, if you plan on frequently cooking for large groups, Consumer Reports recommends focusing on food processor models with between 11 and 16-cup capacities. Otherwise, paying less for a seven to eight-cup capacity might deliver more bang for your buck. Finally, Mariette notes that you’ll always want to pay close attention to the manufacturer’s refund policy and warranty coverage, should you find yourself dissatisfied with the device’s performance, or if it breaks within a relatively short time after purchase. Based on everything we learned during our research, Ninja seems to have packed Intelli-Sense with a ton of proprietary programs and technology, and at a highly competitive price. In fact, you’d have to pay several hundred dollars more to get your hands on a competing ‘smart’ blender or food processor, which still might not deliver the same level of functionality. Just keep in mind that you’ll need to have plenty of cabinet space in your kitchen to store all of its attachments, and that it’s not designed for hot blending. Add to this that Ninja stands behind the device with a 60-day money back guarantee, and you might not have much more to lose than a bit of your time (and perhaps return shipping charges) for giving it a try. Speaking of which, because Intelli-Sense is available through so many national big-box retailers, you might be able to get one in your hands faster and save on S&H charges by buying locally. Not to mention that this could make the return process as easy as hopping in your car. I sat and watched the half-hour infomercial and was excited to order direct from Ninja, however, the at no cost upgrades they preached are really at an additional cost. I received a 20-minute transfer call run around by the sales reps to find the person who would honor the promotion, leading nowhere and eventually caused me to just hang up. I feel like this is a bait and switch tactic! Write a Review for Ninja Intelli-Sense!